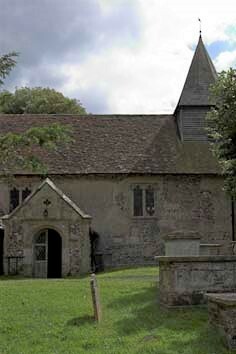 The church is mainly C12 with a north chapel and short south aisle dating from the C13 (the latter rebuilt in 1883). Nave and chancel were remodelled in the later C14 and C15, particularly the windows. 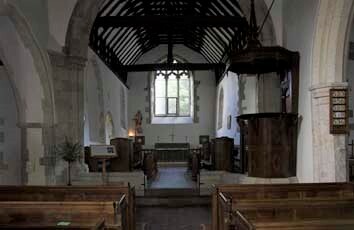 The chancel served a small priory, which still stands in part to the south. Wilmington is famous for its Long Man, which is cut into the Downs and is of uncertain age. It is unconnected with the church, which was linked to the adjacent priory. This was probably founded in the C12, though the earliest certain date is 1243 (VCH 2 p121). A dependency of the Norman house of Grestain (3 p38), it administered its English estates until dissolved as an alien priory in 1413/14. The priory, the main buildings of which still stand, had no church and the monks, of whom there were never many, used the chancel of the parish church. The walls of the nave and the chancel are mostly C12. Probably because it was used by the priory, the latter is remarkably long for the period and was never lengthened, as round-headed windows near the east end on both sides show. These are large and the heads almost pointed. Taken with the concentric rere-arches they point to a date after c1150. There are also traces of a round-headed south doorway. Nothing visible supports Pevsner’s suggestion (BE p630) that there was blank arcading round the windows, like Little Horsted, though at sill-level outside on both sides there are remnants, clearer to the north, of an external frieze with small triangles. Stone benches inside along the walls were probably for the monks, but are very low, suggesting the floor-level has been raised. In the C13 were added a north chapel off the nave at its eastern end and a south aisle covering the eastern part of the nave. From its position, the chapel was parochial. The external detail is C19, but the plain, slightly chamfered pointed arch to the nave is early C13, with plain abaci. The main two-bay south arcade has double-chamfered heads, semi-octagonal responds and a circular pier and is thus later C13. The present chancel arch is a C19 replacement in C13 style and its triple shaft responds are based on a mutilated one, which existed in 1851 (3 p60). There may have been a stair at the west end of the aisle leading to the priory (2 p106), though there is now no trace. Because the priory stood to the south, the nave was approached from the north and windows and a double-chamfered doorway were inserted in the C14; their position in the wall is unusually high for the date, but though restored, they are unchanged. All windows are square-headed with two lights, but they differ in detail. The west one is longer, the south west one has panelled tracery (so it is late C14) and the spandrels of the north east one are pierced. W H Godfrey suggested they were reset, probably from the priory (4 p3), but the thinner north and west walls may indicate that they were part of a more extensive C14 rebuilding, together with the roofs of nave and chancel which have tiebeams and moulded crownposts. The boarded belfry and shingled broach spirelet probably date from the same time. Work to the chancel included an ogee-headed lowside and a trefoiled lancet, both to the north. Unusually the lowside is to the east of the lancet. A renewed square-headed south window further east could previously have been C14 or C15. At the latter date, the east wall was rebuilt with a large pointed three-light window with panelled tracery (renewed) and big diagonal buttresses. There was also a big north porch, now altered. Possibly the chancel arch was removed at this time to make room for a rood-screen and loft, of which part of a screen remained in 1794 (Langdon p278). In 1851, the aisle had gone, the western arch of the arcade was blocked and a transept-chapel of unknown date had been added to the other bay (2 p61). A small and featureless round-headed window in the north chapel may have dated from the same time, as may the round-headed arch of the substantial porch, on the gable of which Langdon discerned the date 1793 (p278). Recorded work in the C19 is limited to a restoration in 1883 by Paley and Austin, costing £1790 (BA 20 p293). They repaired the stonework, reinstated the south aisle and arcade and repaired the north chapel, with a new roof, window and doorway, as well as the new chancel arch. Although based in Lancaster, they restored two other churches near Eastbourne around this time, but in this case the vicar exercised detailed supervision (ibid). 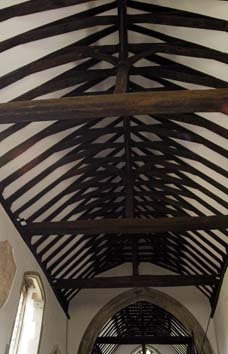 A fire in 2002 was centred in the north chapel, where it destroyed the roof and damaged much stonework. 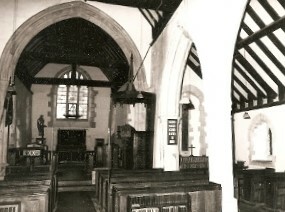 When rebuilt, the opportunity was taken to place a new vestry in the space between chapel and north porch and to open up the chapel which had been largely filled by the organ. The rest of the interior suffered from smoke damage and a number of fittings (see below) probably disappeared as a consequence. Aumbries: (East wall) Two square-headed ones with modern doors, probably part of the C15 rebuilding of the east wall. 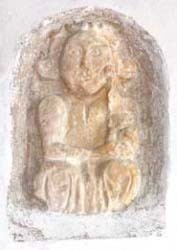 Carving: (North chancel, above lowside) Very weathered and formerly clogged with whitewash. It has previously been proposed that it represents either an angel or a virgin and child (Mee p415), though Pevsner thought it C13 and male (BE ibid), such was its condition. It was moved from outside in 1948 (Langdon ibid) and after the fire it was cleaned. Though damage has become more apparent, the conclusion was that it is likely to represent a virgin and child, with characteristics supporting both a C11 and a C12 dating (1 p194). Door: (In north porch) C14 with its original hinges. Font: C14 with a deep square bowl. It stands on four corner shafts with capitals carved into the base of the bowl and a round central support, like others in the Eastbourne area. 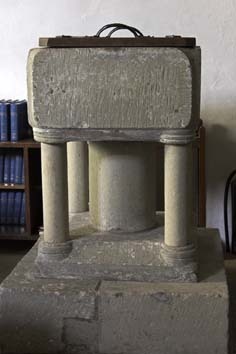 A suggestion (www.crsbi.ac.uk retrieved on 22/4/2013) that it is an early C13 continuation of the classic C12 Sussex font overlooks the other fonts of this type in the vicinity which can be dated to the C14 with confidence. 1. (Chancel north and south lancets) Single figures of saints, 1847, which the church guide attributes to M O’Connor. The intensely coloured glass makes this attribution plausible. 2. (South aisle, first window) Jones and Willis, 1947 (WSRO Fac). 3. (South aisle, second window) Jones and Willis, c1926 (signed). 4. (South aisle, east window) F Stephens, 1960 (signed). Curiously insipid. 5. 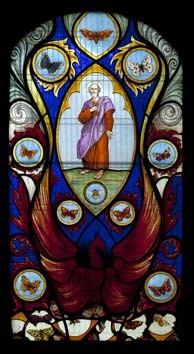 (North chapel until 2002) St Peter, surrounded by decorative glass with butterflies, bees and moths. Probably continental and late C18, it is mentioned by Horsfield (I p326). It was severely damaged in the fire and fragments, including the figure of St Peter and most of the butterflies, many still showing the marks of the fire, were incorporated in a new design by P San Casciani, 2004 (JSG 28 p149). This is based on a phoenix and employs the vivid colours of the original. By the same artist and made in the same year is a small panel, based on Flemish C16 work, of ‘The Love Garden’. 6. (West window) P San Casciani, 2000, semi-abstract, with a motif of rings, inspired by the yew in the churchyard (ibid 24 p128). Inscription: (North nave) 2004, commemorating the restoration after the fire. A circular inscription set within an older surround that survived the fire. Carved by G Aldred (Artist’s website). 1. (South aisle, west wall) The reset frieze and pediment from a later C16 monument, said to have been to a member of the Culpeper family (5 p8). 2. (Formerly) Rev James Capper (1835?) by L Parsons (Roscoe p952). Painting: (Nave north wall – formerly) Remains of C17 black letter inscription. 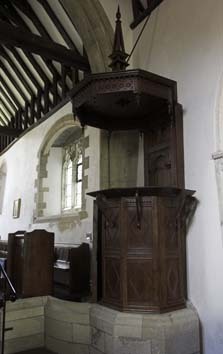 Pulpit: Early C17, which retains its panelled back and sounding board. A tall spike on the latter resembles a miniature Eiffel Tower. Royal Arms: (South nave) A painted panel showing the arms of Queen Victoria, probably from the early part of her reign.